The County of Orange and OC Parks are pleased to present the annual Halloween Zoo-tacular at the OC Zoo located inside Irvine Regional Park on Saturday, October 28 from 10 a.m. to 4 p.m. Celebrate the season with festive activities and the animals of the OC Zoo! The OC Zoo will reopen Oct. 21 after being closed for the Canyon Fire 2. OC Zoo, OC Parks and OC Animal Care staff evacuated the animals prior to the fire, and they have since returned. Portions of Irvine Regional Park remain closed to the public, due to numerous hot spots, weakened trees and other hazards. Families are invited to bring their children to trick-or-treat, explore the zoo during a spooky scavenger hunt and create Halloween and fall-themed crafts. 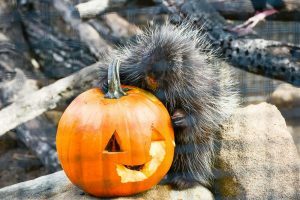 OC Zoo animals will join the fun as they receive treat-filled pumpkins throughout the day, and the first 100 children in costume ages 12 and under will receive a free gift. Join the Halloween fun at the OC Zoo in Irvine Regional Park on Saturday, October 28!